Leader’s behaviors seem to be the Holy Grail for the Lean community. It’s not. The image at right is from the Lean Enterprise Institute’s Lean Transformation Summit, held on 17-18 March in Las Vegas, and shows the results of a survey. 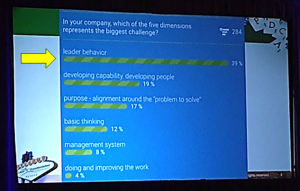 The question is: “In your company, which of the five dimensions represents the biggest challenge?” Answer: “leader behavior” for 39% of respondents. The remaining items are also related to leader’s behaviors in lesser or greater ways. Or, so it would seem. When confronted with the problem of poor or failed Lean transformations, the starting point is always leader’s behaviors. Why? Because Lean must be led, and because behaviors are an important part of effective leadership. It seems sensible. Yet, I made this same mistake back in 1994. “Leader behavior” is far too simplistic an explanation. It is the apparent problem, not the actual problem. Recognizing my error some nine years later, I set out to better understand the following relationship: beliefs → behaviors → competencies. In other words, beliefs inform behaviors, which in turn results in competencies. Efforts to change behaviors will be unsuccessful if fundamental beliefs are unchanged. I developed this concept in two academic papers and later featured it in Chapter 5 of my 2008 workbook, Practical Lean Leadership: A Strategic Leadership Guide for Executives. I further developed this concept in the 2011 book, Moving Forward Faster: The Mental Evolution from Fake Lean to REAL Lean. This book identifies 24 economic, 22 social, and 18 political beliefs possessed by leaders that must change in order for a Lean transformation to succeed. There are also 21 historical problems or errors related to management practice that impede Lean transformations. All 64 beliefs strongly influence leader’s behaviors. Left uncorrected, Lean has no chance of succeeding – meaning, replacing current state conventional management practice with future state Lean management practice and creating an enduring Lean culture. The continued focus on behaviors in the Lean community – and especially by those who lead the Lean community – is very disappointing because it generates unnecessary and lengthy delays towards achieving a better future state. Though, it does represent near-endless opportunities for those who sell books and training programs to improve leadership behaviors. People get stuck on this for years and years because they assume the beliefs possessed by conventional leaders are the same as those possessed by Lean leaders. That is a huge mistake, as is the lack of recognition of the role that Toyota-style kaizen plays in changing leaders’ beliefs. But, if you want to actually move forward faster, then you have to comprehend the relationship: beliefs → behaviors → competencies. And you must understand the specific beliefs that generate the behaviors you want to change and how they, in turn, form leaders’ competencies. In other words, you need the data on the factors that inform leaders’ beliefs. Only then, you can you hope to correct the many behaviors that disable Lean management. The Holy Grail is a legend. So too is improving leadership behaviors. If you want a different result, you have to think differently. And that begins on the shop floor. Leans Holy Grail: Otherwise defined as the “organizational ideal”. Bob,any organizational ideal is unattainable. I would think that YOU of all these ……………..would know that. Bob, why not just say that the workshop/training, that the process is the Adult Learning Cycle and the Tools are experiential exercises.